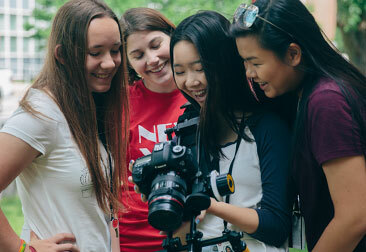 Whether you see yourself pursuing a career in filmmaking or want to learn these practical and applicable skills for yourself, New York Film Academy’s film camps are perfect for everyone with an interest in making films. In all New York Film Academy (NYFA) summer film camps for teens, each student writes, shoots, directs and edits his or her own films. Our film camps are designed for people with little or no experience in making films. The programs focus on the fundamental elements of visual storytelling that enable the students to direct their own projects. During NYFA’s teen film camps, each weekday is split between in-class instruction and on-set production. The below subjects are taught both in-class and on set, where students get to apply the lessons they learned in the classroom to a real film set. In our longer film camps (three, four and six-week), these subjects will be treated in greater detail and taken to a higher level than in the shorter camps. Students in longer programs make more films and, therefore, have more opportunities to develop their abilities and employ what they have learned. But regardless of the length of the camp, our students would agree that they learned more in even just one week than some learn in a month through being on set and gaining hands-on experience working on actual productions. At the end of each camp, the students’ directorial work is celebrated in a screening open to crew, faculty, family, and friends. Some of the classes and subjects students can expect to cover in the New York Film Academy’s filmmaking camps include the following. As the director is the leader of a film set, students will learn the language and practice of filmmaking so that they can apply this knowledge to their own original films. They will discuss shooting plans for their film projects and screen their work with their instructor throughout the course. Directing is approached as the art of visual storytelling. Students will find that directing the camera concerns more than just where to place the camera. Through hands-on demonstrations, the students will learn how camera movement, visual arrangement, and editing patterns not only depict the action but also express the underlying drama. Each student directs a series of films in crews of four. Students also rotate in these crews among the principal film crew positions. Crews are required to meet each week with the directing instructor to review scripts and shooting plans. It’s the script that is the backbone of any film and in NYFA’s summer film camps for teens, students will become comfortable writing original screenplays. Students learn the process of taking take a story from initial idea, through treatment and step outline, to a finished script for their final film with the help of our exceptional faculty. Story structure, theme, character, tension, and conflict will be explored as they are used in filmmaking. 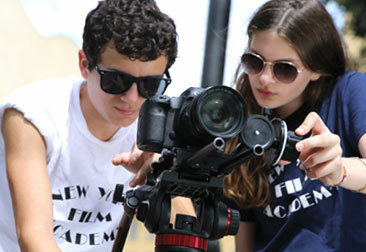 NYFA’s summer camps for teens feature a no-nonsense approach to cameras, placing students behind a camera from day one. Students will learn to shoot using industry-standard HDSLR cameras. They will learn proper loading, operation, and maintenance of the camera. In the first week students will shoot and screen tests for focus, exposure, lens perspective, film latitude, slow/fast motion, and contrast. Any students needing extra instruction are given review sessions as necessary. *Students in the 6-Week 16MM & HD Filmmaking Camp (LA only) will learn to use both digital and 16mm formats. While the script provides the backbone of a production and cameras capture the action, it is the editing process that gives all that footage actual structure. Students will learn to edit their films with digital editing software. Their instructors will cover both the technical aspects of the editing process, as well as the conventions and theory behind editing choices and styles. To direct actors, one must learn how to work with actors and receive instruction and experience in how to get effective performances from actors in their film projects. Students also get the chance to gain some experience as actors, providing them with important insight into what happens on the other side of the camera. Each summer film camp for teens at the Film Academy will challenge you to become a well-rounded filmmaker with actual experience making films. Click here to apply today.